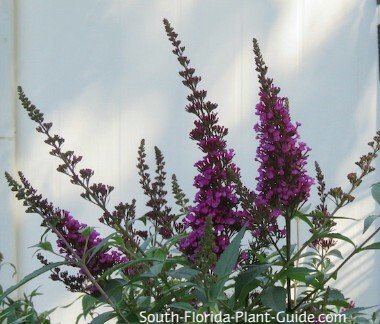 Of all South Florida's butterfly garden plants, buddleia - or "Butterfly Bush" - is one of the best for attracting many different kinds of butterflies. The lovely, fragrant flowers in conical clusters appear on and off all year (more during warmer weather) at the tips of arching branches. 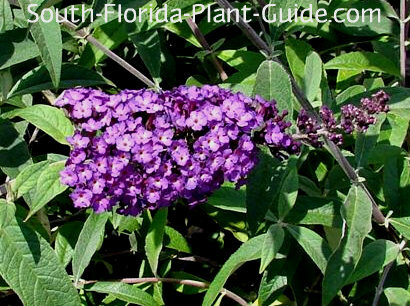 If you are one of those people who truly enjoy puttering about in the garden, a butterfly bush is ideal for you. For a bit of regular attention it will reward you with its showy year-round flowers and butterfly-attracting qualities. Though easy care in most respects, this is one shrub that loves being trimmed nearly all the time. It responds beautifully to shearing with hedge trimmers, or at least needs regular deadheading to stay bushy, pretty, and in bloom (the more you deadhead - cut off spent flowers - the more flowers you'll get). This shrub, with its airy look and cottage-garden charm, works best in an informal landscape. Usually seen bearing purple flowers, buddleia (sometimes spelled buddleja) also comes in varieties with lilac, pink or white blossoms. Some authorities consider it to be invasive, so avoid planting at the edge of a preserve or open natural area...or cut off spent flowerheads before they go to seed. The flowers also attract hummingbirds. This plant grows fast but can be regularly trimmed to keep it 4 or 5 feet tall (and wide). It's cold hardy and does well anywhere in South Florida, but it can thin in winter, so avoid a location where there are strong winds. Full to partial sun is best. Blooms are fragrant and appear on and off all year. Add composted cow manure and top soil or organic peat humus to the hole when you plant. Trim often to keep the plant blooming and full. Do a hard pruning in spring (late March to early April) for overall size. Though it requires well-drained soil, this plant needs regular irrigation with time to dry out a bit between waterings. Fertilize 3 times a year - in spring, summer and fall - with a top quality granular fertilizer. You can supplement feedings with bone meal and/or liquid fertilizer to promote heavier bloom. Plant 3 feet apart. The bush grows outward with long branches so provide enough space so that nearby plants aren't covered up by this one's exuberant growth. Come out from the house 3 feet. If planting along a walk or drive, come in 4 feet. This shrub will grow in a large container in an area of good sunlight. COMPANION PLANT SUGGESTIONS: Plumbago, muhly grass, snowbush, hibiscus, Texas sage, golden dewdrop, and lantana.